The Emperor of China lives in the most marvelous palace in the world, made completely of porcelain, and his garden is full of the rarest flowers. Yet loveliest of all, say visitors to his realm, is the song of the nightingale in the forest by the sea. The Emperor has never heard this nightingale, and even his courtiers, searching far and wide, cannot find her. It takes a gentle kitchen maid to draw the nightingale to court. The Emperor is enchanted by the bird’s sweet song — until he is given a bejewelled nightingale with a mechanical tune. Will the mighty ruler learn too late the value of what is simple and genuine? Hans Christian Andersen’s beloved story was written in 1844. Graceful and alive to the tale’s rich humor, Stephen Mitchell’s retelling is paired with exquisite paintings by Bagram Ibatoulline. The result is a timeless edition of a treasured classic. In China, as you know, the Emperor is Chinese, and all the people are Chinese, too. The story you’re about to hear happened a long time ago, but even after all this time it hasn’t been forgotten, and that’s why I can tell it to you now. The Emperor lived in the most marvelous palace in the world. It was made completely of porcelain, just like fine cups and saucers. All the walls and floors and tables and chairs were porcelain, and they were so thin and breakable that you had to be extra-specially careful when you touched them. The Emperor’s garden was filled with the rarest and most beautiful flowers. Each one had a little silver bell tied to it. Whenever you walked past a flower, its bell would tinkle so that you’d be sure to notice it. The garden stretched out so far and so wide that even the Chief Imperial Gardener had no idea where it ended. If you kept walking past the flower beds, you finally came to a magnificent forest, with tall trees and clear lakes. The forest stretched all the way to the sea, which was deep enough so that large ships could sail right in under the branches of the trees. In this forest near the seashore there lived a nightingale. Her song was so lovely that even the fisherman, who was busy pulling in his nets in the moonlight, would stop and listen to her. He looked up into the treetops, and a smile lit up his face. “Ah, how beautiful that is!” he said to himself. But then he had to get back to his work, and he stopped listening. And when they returned home from their travels, they had many stories to tell, and the cleverest among them wrote many books about the city and the palace and the garden, and about how magnificent they were. But they always saved the nightingale for last, because she was the loveliest of all. And all the poems that the poets wrote were about the nightingale in the forest by the sea. These books made their way through the whole world, and in time some of them reached the Emperor. There he sat on his golden throne, reading and reading. Now and then he smiled and nodded his head. He was very pleased that everyone admired him so much and had such wonderful things to say about his city and his palace and his garden. And immediately he summoned his Chief Imperial Gentleman-in-Waiting. Now the Chief Imperial Gentleman-in-Waiting was so exalted a person that, if anyone of a lower rank asked him a question, he wouldn’t even answer with a word. “Ppp!” he would say — and that means nothing at all. “Tsing-pe!” said the Gentleman-in-Waiting, and he ran up and down all the stairs again, through all the rooms and corridors. And half the courtiers ran with him, since they weren’t particularly fond of being punched in the stomach. There they all were, trying to find out about this extraordinary nightingale that everyone in the world had heard of — everyone, that is, except the people at Court. [Mitchell’s retelling is] beautiful, and true to the original tale. Oversize, with dazzling, colorful illustrations, it has a homespun quality, the flavor of something not written but said aloud to a child. 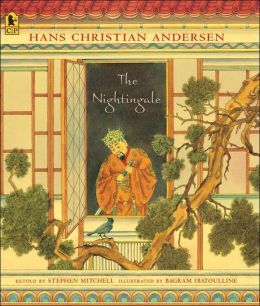 Editions of The Nightingale abound, but this makes a sumptuous, readable alternative that is true to its original. Mitchell’s version stays close to the original, with an added punch of satire. In an author’s note, Mitchell comments that he tried to re-create the original’s “energy, wit, and charm,” and his language is playful and funny. Even if there are already several editions of the story on the shelf, consider this for its fresh, lively language and for Ibatoulline’s stunning paintings. A gorgeous new edition. Stephen Mitchell’s adapting is more in the nature of embroidering, not butchering . . . Bagram Ibatoulline’s illustrations . . . make slowing down a pleasure, to follow all the details of the scenes. Ibatoulline’s artwork carries its store of technique and research lightly, and the narrative unfolds clearly in the pictures. Mitchell’s adaptation of the work is nimble as well. The exquisite jacket — which features delicate red lettering on a damask-patterned gold background and a cutout revealing a painting of a nightingale — sets up high expectations, and both Mitchell (The Frog Prince) and Ibatoulline (Crossing) meet them Mitchell’s language is light and melodic. This volume has a more formal elegance than Jerry Pinkney’s recent The Nightingale, and it is just as impressive. This exquisitely designed and illustrated retelling is a lush interpretation of Andersen’s tale.